Would you agree that this cabinetry set looks cluttered? When the kitchen upper cabinet designer leaves space over the cupboards, take extra care to avoid using too many things to decorate with. Using small accents of color can really add to the beauty of a dark wood cabinet set, such as these in the image. This is just my opinion, but my eyes tend to focus on the overabundance of things on top of the cupboards rather than on the beauty of the cabinet’s design. These real wood Cherry cabinets are stunning and yet all of the stuff above the cupboards is very distracting to the eyes. Do you notice how the entire space from the top of the wall cabinetry to the ceiling looks cramped and overstuffed? Let’s just imagine for a moment what this cabinet design would have looked like if the owner had only used a couple of beautiful things on the wall cabinets that are on the lower parts of the staggered cupboard’s design. Would you agree with me that this would have looked a lot less cramped to the ceiling and less over done? What about the uniformity of the color selections used in the design of the space over the kitchen upper cupboards, does that make a difference in how things appear? Of course it does. Imagine with me again, if only the blue accents had be strategically placed on the upper cabinets that were installed lower than the rest and nothing was placed on the higher ones. 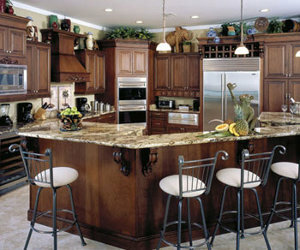 This would have left the viewers of this photo with a pleasant feeling of beauty in the design of these cabinets. Less is best in my opinion when working on kitchen cabinet accents. Designs have a richer feel and appearance when there is less clutter. Always decorate the area above or over the wall cupboards sparingly. This will add a touch of class to the already beautiful cabinets that you have. As seen in many designs, too many things placed over the upper cabinets will ruin the look of a gorgeous Formica or real wood kitchen.